SANTA BARBARA, Calif. Firefighters made big strides toward getting ahead of a forest fire in mountains northwest of Santa Barbara, Calif., and stopped several smaller blazes around Southern California. The wildfire had carved its way through 3.2 square miles of chaparral, oak and pine Tuesday, but by day's end firefighters had it 65 percent contained and residents from a few dozen homes that were evacuated Monday were allowed to return, fire spokesman Manuel Madrigal said. More than 600 firefighters, supported by a dozen aircraft, were on the lines about 10 miles northwest of the scenic coastal city. At the fire's height, thousands of campers and day visitors scrambled out of the forest on the Memorial Day holiday, and about 50 homes, mainly cabins and vacation rentals, were evacuated. It burned a U.S. Forest Service garage and two vehicles. Firefighters took advantage of calm midday winds to start to surround the blaze as it moved east along the Santa Ynez Mountains. Ample fuels and late-season conditions had brought fears that the fire would move toward Santa Barbara. "There's a lot of dry vegetation in its path," Sadecki said. "It's still spring  it's not even summer  and it's burning like it's August or September." The fire was burning near Paradise Road, which meanders along the north side of the Santa Ynez Mountains. Santa Barbara and neighboring communities sit on the other side of the coastal range, which rises quickly from near the Pacific shoreline to peaks topping 3,000 feet. A second wildfire broke out Tuesday in the nearby wine country hills of Santa Ynez at about 3:30 p.m. It quickly grew to 170 acres, jumping Highway 154 and 246, but dozens of firefighters and two water-dropping helicopters knocked it down before it did any damage, Sadecki said. Despite its bucolic setting, the area 100 miles northwest of Los Angeles has seen terrible wildfires, including a 1990 blaze that destroyed 641 structures, most of them homes. The summer of 2007 was marred by a gigantic fire that erupted on July 4 and burned for months. Another blaze flared just before noon Tuesday near the Magic Mountain theme park and Interstate 5 north of Los Angeles. It quickly consumed 55 acres of brush, but was almost contained by nightfall after hundreds of Los Angeles County firefighters responded with air support. At about the same time another fire broke out near homes and a cemetery in Simi Valley, but Ventura County firefighters had it contained a few hours later after only eight acres burned. 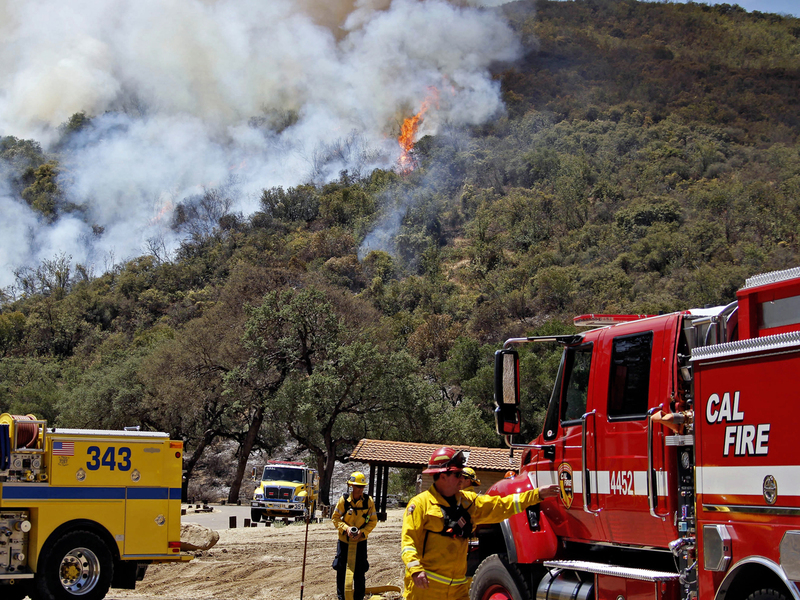 In San Diego County, investigators determined Tuesday that recreational shooting sparked a wildfire that has burned nearly 1,000 remote acres southeast of Julian. State fire Capt. Mike Mohler tells U-T San Diego that the shooters who started the fire on Sunday have been identified, but it was not clear whether criminal charges were planned. The fire was 85 percent contained.